LANSING—State Sen. Ken Horn addressed a crowd gathered on the Capitol steps on Thursday in support of child abuse awareness and to support April as Child Abuse Prevention Month. The rally was part of an annual effort by the Michigan Children’s Trust Fund to acknowledge the importance of families and communities working together to prevent child abuse in all of its forms. “The work that Children’s Trust Fund does here in Michigan with contributions from supporters, along with symbols like the blue pinwheel, are vitally important in making sure that we raise awareness and honor all Michigan children,” said Horn, R-Frankenmuth. “I was happy to see in Lansing today one of our great partners from the 32nd District, Suzanne Greenberg from the CAN Council Great Lakes Bay Region. Several speakers also highlighted the 13th Annual Pam Posthumus Signature Auction Event, which will be held on Wednesday, May 13 from 5-9 p.m at the Lansing Center. Individuals wishing to get involved with the May event or the Michigan Children’s Trust Fund can visit www.michigan.gov/ctf for more information on goals, events and ways to help and donate. 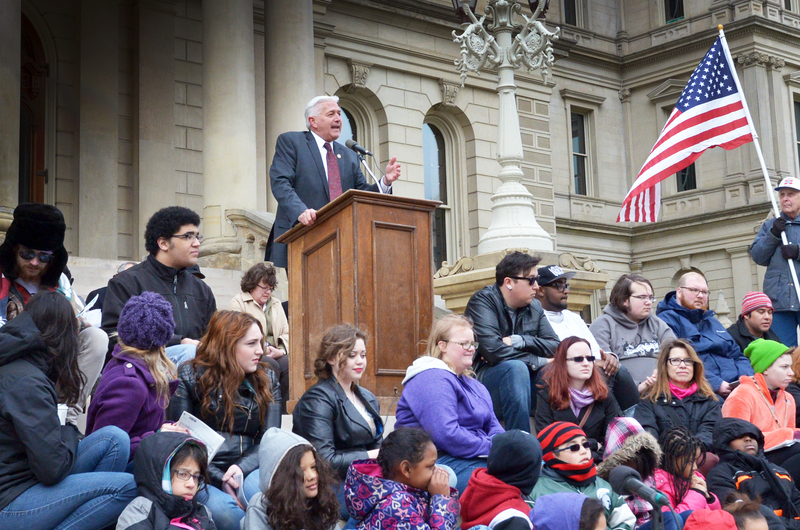 Photo Caption: State Sen. Ken Horn, R-Frankenmuth, addresses the crowd at the Michigan Children’s Trust Fund (MCTF) rally on the Capitol steps Thursday morning. The MCTF hosts a rally every year at the Capitol and invites elected officials to speak in an effort to bring awareness to the issue of child abuse in Michigan.